Collingwood has much of its 2019 AFL squad in place following a swathe of new or recent re-signings. With retention and development from within being a strategic focus for the club, many of the players out of contract at the end of the recently completed campaign have recommitted. 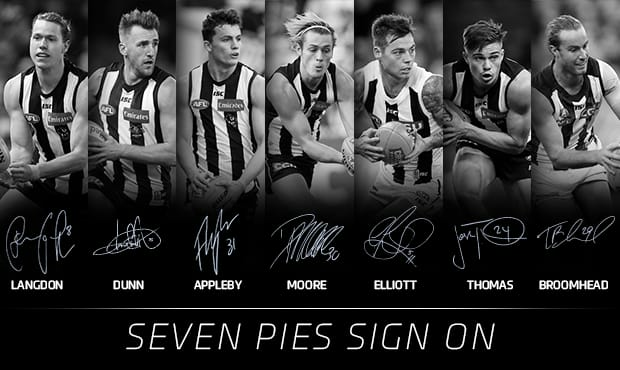 In the back half of the ground, defenders Lynden Dunn (1yr), Darcy Moore (2yrs), Tom Langdon (3yrs) and Flynn Appleby (2yrs) have penned new deals. Further afield, Tim Broomhead (1yr), Jamie Elliott (1yr) and Josh Thomas (3yrs) have set themselves for 2019. While Broomhead continues to make a good recovery from a broken leg he suffered in the second round of the season, he will be delisted with a guarantee from the club to re-draft him as a rookie for 2019. Appleby, who joined Collingwood as a rookie for 2018, will remain on the rookie list next year. Collingwood list manager, Ned Guy, said that retaining a majority of the squad that played the club into the 2018 grand final was a priority. “This is a squad that is still discovering how good it can be, a squad that is still to ripen,” Guy said. “For a majority of the players on our list, the prime years of their careers are out there in front of them.